If you are like our family we eat ham each year for Easter and that means we have left over ham to use for the next day or two. We have recently found a delicious recipe that makes all of that left over ham into a fabulous meal that will have your family begging for more! 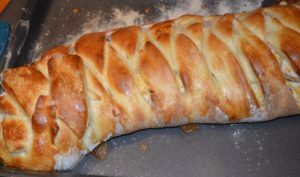 Try this Ham Braid loaded with cheese and flavor! To start you will need to make the bread – in case you haven’t seen any of our other posts – everything we do is from scratch and is loaded with extremely good ingredients home grown and made with love! 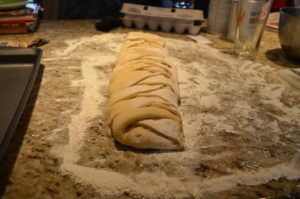 Bread Dough: (we use a recipe from Taste of Home – 2008 by Marcia Vermaire from Michigan) It is one of our favorite homemade breads and turns out fabulous any which way we make make it. Dissolve yeast in water. Add butter, sugar, salt, eggs, and flour to form a soft dough. Knead on a floured surface until smooth and elastic (about 6 minutes) Place in a greased bowl turning to coat entire ball. Cover and let rise in a warm place until doubled (about 1 hour) Punch dough down when ready and roll out on a floured surface to form a rectangle. 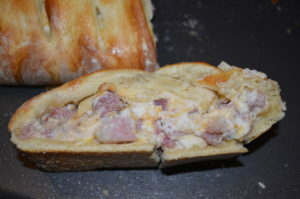 Inside Ingredients: 3 c. chopped ham, 2 – 3 c. cheddar cheese, 10 oz. of ricotta cheese, 1/2 tsp. pepper, 1/2 tsp onion salt. Mix all ingredients. Spoon ham mixture down center of dough. Cut 1 inch wide strips about 3 inches in length (stop about 1 inch away from ham mixture). Starting at one end fold end piece up over the ham mixture. Then fold alternating strips at an angle across filling. Fold the opposite end up and over the mixture and pinch to seal. Cover and let rise in a warm place (about 30 – 60 minutes) or until almost doubled. Beat one egg yolk with 1 tsp of water and brush along top of braid. Bake at 375 degrees for 25 – 30 minutes or until golden brown. Cut into strips and serve warm!